Health Insurance and Managed Care: What They Are and How They Work (formerly titled Managed Care: What It Is and How It Works) is a concise introduction to the foundations of the American managed health care system. Written in clear and accessible language, this handy guide offers an historical overview of managed care and then walks the reader through the organizational structures, concepts, and practices of the managed care industry. 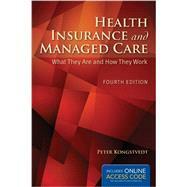 Health Insurance and Managed Care What They Are and How They Work: 5 out of 5 stars based on 1 user reviews.